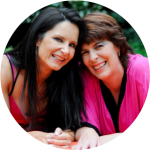 Vicky and Madeleine started Goddessense in 2006 out of a very personal need to share with others the lessons they had learnt. This need was fueled by a deep knowing that it was time for women to reclaim their gentler, feminine power and all they need to get back in the driving seat of their own life, is the knowledge on how to do so. Vicky is an entrepreneur, certified hypnotherapist and holistic life coach. Her creative genius has led her to successfully create and run several businesses, each with their own unique spark of brilliance. Her own journey to rise as a phoenix from the ashes gives her the unique ability to share from personal experience with empathy and understanding.